Oceanography is a young science. The reason for its youth is that “brute difficulty” of measuring the ocean. Every aspect of the ocean militates against the scientist trying to understand its ways and means. The ocean is incredibly vast; seawater covers 71% of the planet. It’s deep. Mt. Everest could fit into the Mariana Trench, the deepest feature, with 10,000 feet to spare. The average depth of the Atlantic is 12,000 feet; the Pacific is still deeper. Also, ocean never stops moving on the surface and in the abyss. Scientists in other disciplines can at least see their subject of enquiry, but human eyes are of scant use in oceanography. From Knorr’s bridge, 45 feet above the surface, you can see but 12 miles of the surface of the sea, enough for safe navigation, but useless for scientific purposes. And below about 300 feet, you can see nothing, for no sunlight penetrates. Scientists, therefore, needed instruments, surrogates for their senses, to understand the ocean. But before World War I, there were none much more sophisticated than a weighted line to measure depths, a thermometer, and a bucket to draw up water samples. That changed radically during World War II. The sophisticated solid-state electronics aboard Knorr owe their origins to submarine warfare—specifically to sonar. Unlike light, sound travels very effectively through seawater. Sonar was invented slightly before the First World War, but it didn’t develop much beyond a crude and unreliable state until the U-boat threat in 1939 set allied scientists to work with a sense of urgency. Then during the Cold War that followed the hot one without intermission, U.S. Navy chiefs recognized the vital need for ocean scientists both to teach them the ways of the ocean and develop instruments to find Soviet submarines and to hide their own. Oceanographers from myriad institutions received blank checks for research, and scientists, knowing a good thing when they saw it, went to work on all sorts of ocean research. As someone put it, the navy then received answers to questions they never asked. Those halcyon days are over now, money less forthcoming, but the science leapt from an adolescent state to something approaching its present maturity. 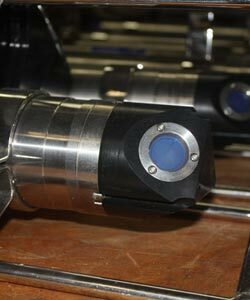 Clever measuring devices, born for strife, passed into the hands of peaceable oceanographers using variations on the sonar concept to understand nature, not hunt subs. Of these, perhaps the most useful today is the Acoustic Doppler Current Profiler (ADCP). That mouthful of name refers to a fairly straightforward principle. You shoot out a pulse of sound, it bounces off of an object, and returns with information from which you can calculate certain things, such as location and speed of travel of that object. That’s basically what radar and sonar do in air and water, respectively. The ADCP does that in a special way. You might have noticed the way the pitch, or frequency, of a police or fire-engine siren changes as the sound approaches and passes you. 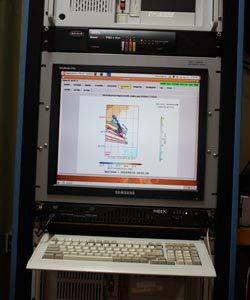 This is the “Doppler shift.“ ADCPs measure current directly by pinging sound waves off of particles such as sediment or plankton or anything else suspended in the water column and drifting with the current. The wave arrives back at the instrument with a slightly different frequency than the outgoing wave, and from that difference, scientists (and computers) can calculate the speed at which the particles are moving—current. Western boundary currents containing hot tropical water tend to be less rich in plankton than cold northern waters that have been uplifted from the depths, but there are always “targets” of one kind or another in the ocean to ping sound off of. 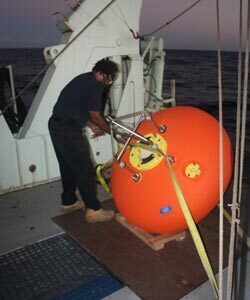 ADCPs have developed and advanced over the years into one of the most useful and versatile means of measuring oceans. Two ADCPs are mounted in Knorr’s hull constantly pinging the current. Constancy is important because, as stressed earlier, current—and everything else that moves in the ocean—varies, so oceanographers are always seeking ways to reconcile short-term variation with long-term trends. 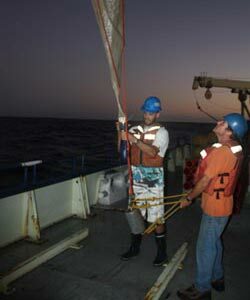 In addition to these “shipboard” ADCPs, Lisa has mounted others on the top-float of her moorings—along with the acoustic current meters—to measure the large-volume flow close to the surface. 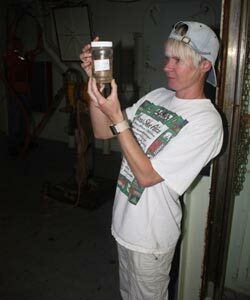 After they’ve been down there doing their work for three years, they will deliver a fairly complete profile of the Agulhas at this carefully chosen location. But the device that had perhaps the greatest liberating impact on the practice of physical oceanography (and seafaring) is one we take for granted at sea and ashore. It shows up in cars, on cell phones, even watches—the GPS. All of this precision acoustic gear would be of little use if we didn’t know where we were when we did the measuring. The fancy technology on the bridge that positions Knorr exactly where the scientist wants her all depends on those 24 satellites orbiting Earth fixing our position within a few meters. With all respect for the mariners who made brilliant voyages using celestial navigation, that system is not even nearly accurate enough for science purposes. And neither were the first land-based electronic systems that preceded GPS. Still, the earlier generations of oceanographers did remarkable work within their technological limitations. Well, it’s a gorgeous evening out here on the Indian Ocean, and it’s reflected in the buoyant mood aboard Knorr. That’s usually the way of it—the ocean controls everything, and all that gee-whiz technology notwithstanding, we’re still a ship floating on the sea, in that sense no different than in the pioneering days.